This is the last of four posts covering facilitation games for the different phases of meetings – Check In, Opening, Exploring, Closing. As with Opening and ‘Exploring-Divergent’ activities, there is a lot of overlap between ‘Exploring-Convergent’ and Closing activities. For me the distinction is the move to a planning phase: establishing a goal to move forward with, and the activities to support it. If the focus of the session is Planning, this could use up to half the allotted time, for others around a third to a quarter. It’s also important to be aware of the time span available to implement change, and have the group select the most valuable area of focus within that context. Finding the right focus is much more reliable when multiple interests are represented – it’s easier to avoid personal agendas and generates more discussion around what really is valuable and possible. Selection criteria, such as ‘what we are able to do now,’ ‘what fits best with our team objectives’ and ‘what do we have most passion for’, play a significant part in identifying an achievable goal the whole team is committed to. Ordering – Simply placing the ideas in priority order on the board is a good quick way to agree on importance – a variation is to have the group do this in silence at first, to identify debate-worthy areas. Goal Focus – Friendly way to ensure goals are SMART: once you have consensus on a goal, ask the questions: Can we do it? Why is it important? What could stop us from achieving it? How will we know when it’s done? Clarifies that the goal is appropriate for the skills & responsibilities of the team, as well as the time allotted. Physical interaction tends to be a more effective way to indicate the level of commitment or agreement than a purely verbal response, and is more likely to surface any hesitation, making it easier to clarify the boundaries of what can be achieved. Thumb vote – powerfully simple indication of agreement: Thumb up: I agree / support this goal; Sideways: neither agree nor disagree – will vote with whatever the group chooses; Down: I don’t support this goal / don’t think we should do it now. Jump vote – Fun physical ice-breaker type vote in which each member jumps to indicate their level of commitment, enjoyment, intention etc. – ideally for lighthearted topics and large groups. Use a circle format for a quick opening or closing. This nuts-and-bolts section identifies how to take a new possibility to a new reality, and could feel tiring or exciting – it helps to get this pace right. Again, it’s important to limit the actions to a realistic number. I try to close all facilitated sessions with a quick feedback format that allows participants to review the experience, helps me to get to know the teams better, and helps me improve as a facilitator. The higher the trust relationship, the better the feedback, the more trust is built … and so on. 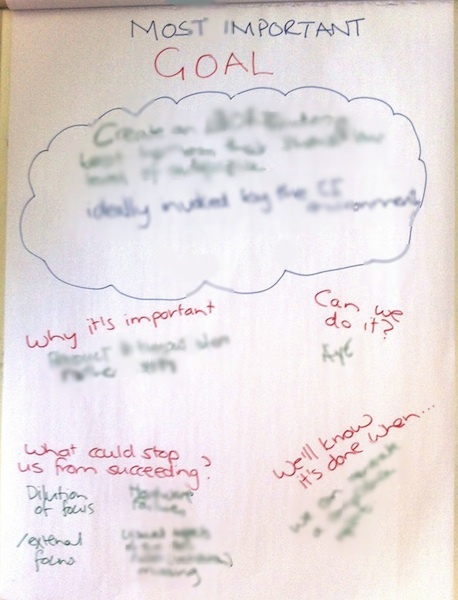 WIIFM – Review the What’s In It For Me notes created in the Check In phase – gives feedback on whether expectations were met, and generates interesting discussion around what was learned in the course. A strong closing session helps to build confidence that the way forward is relevant and attainable. Following thorough Opening and Exploring sections, this creates a reliable process for implementing beneficial action … and repeated consistently in retrospective format puts us well on the journey of effective, directed Continuous Improvement. Most of these activities come from books, blogs or training sessions I’ve been part of; some I’ve created to meet specific needs. Where I can find attributions they are noted; if you see any I’ve missed, or know of links I haven’t found, please let me know in the comments below.